I've been doing a lot more experimenting in the kitchen these days when it comes to cooking. Less recipes and more throwing things together. It's a little bit freeing! But...when you throw together the same recipe again and again and you love it and you realize...this recipe must be shared....then you write it down. And take pictures. And share it on your blog. This is what everyone does, right? Naming recipes is hard. I'm not sure if you're aware of it, but it is. Trying to succinctly but accurately sum up what the recipe is like is SUPER tough! Like this...you pan fry chicken. 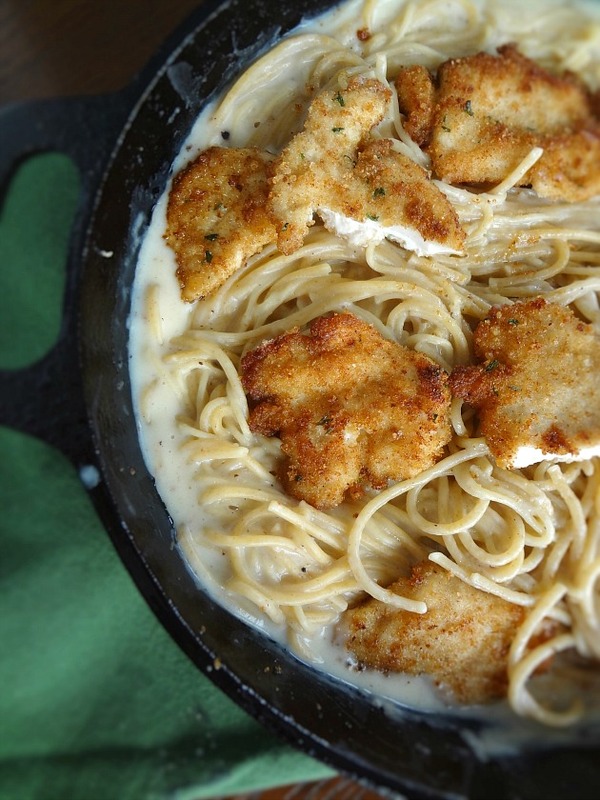 Then you add the sauce ingredients into the same skillet (thusly using the delicious flavor left over from the chicken) and make a creamy sauce. And you eat it with the cooked pasta and chicken. And it's like...what do you call it? I feel pretty good about Creamy Chicken Pasta, but I don't know-what do you think? It's really just comfort food. 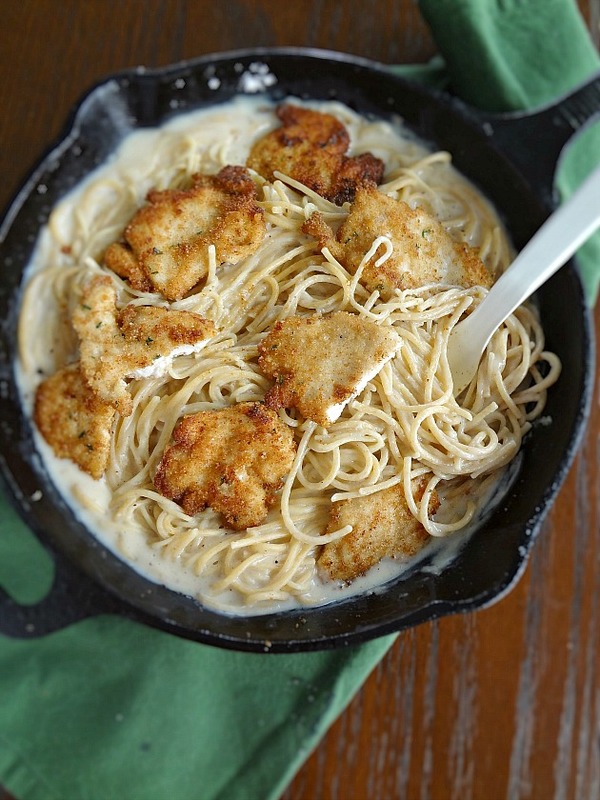 Like super flavorful creamy pasta and crisp chicken...it's a feel-good kind of meal. And I mean...feel free to mix some veggies in if you are so inclined. Personally that sounds terrible to me but I have an unfortunately strained relationship with the vegetables, and if you are one of the lucky people who likes them then I am envious and encourage you to enjoy them in this. Or not. Either way (as long as you like chicken) make it. It's gonna become a new favorite of yours like it is a new favorite of mine! Pour enough oil into a large (I use a cast iron) skillet to just cover the bottom. Heat it over medium-high heat. Dip flattened, cut, chicken pieces into breadcrumbs until lightly coated. Fry chicken in the oil until browned and fully cooked (internal temperature of at least 165F degrees or when no longer pink in the middle), remove chicken from the skillet and set aside. Turn off heat. Boil water for pasta in a separate pot. Cook pasta according to package directions. 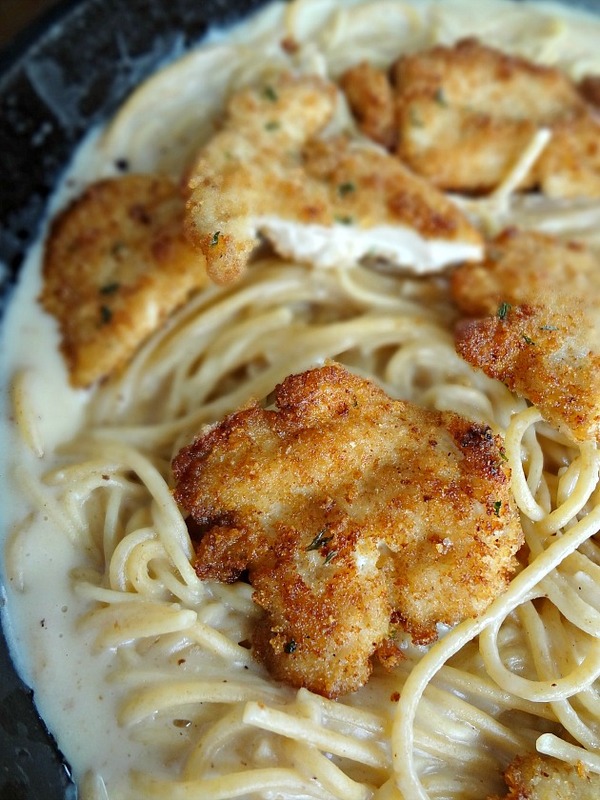 As pasta cooks, add butter to the skillet you had used to fry the chicken, over medium heat and whisk as it melts and to scrape up any bits that may be stuck to the bottom. Once the butter is melted, add the flour and cook for about 1 minute. Add chicken broth and milk to the skillet and cook until thickened. Drain pasta, reserving some pasta water to use in the sauce. Once the sauce has thickened, add reserved to pasta water to reach desired consistency. Add cooked and drained pasta to the sauce and mix until combined. 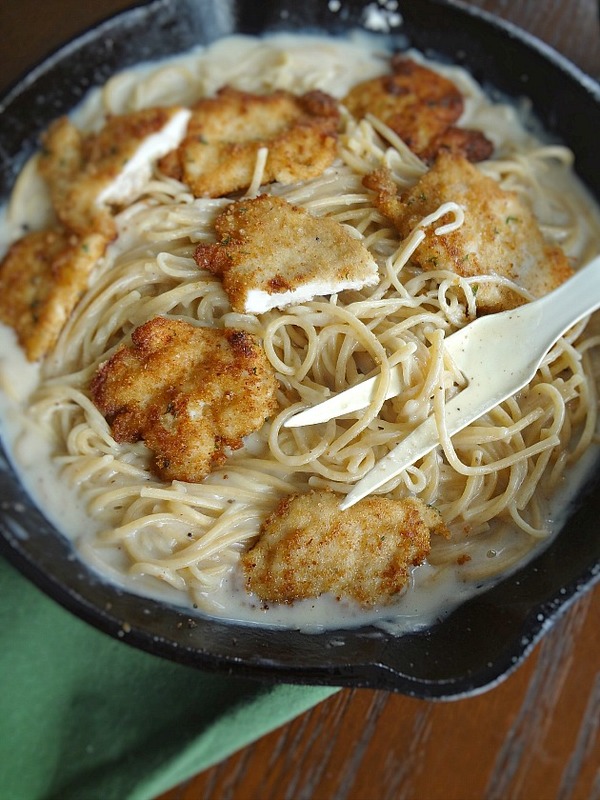 Serve with the set aside chicken and top with grated Parmesan cheese. Enjoy! the best woods for burning on an open fire are also the best ones for producing charcoal gas grill combo grill.